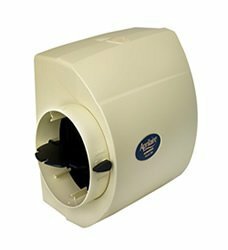 If you have a humidifier in your Maineville, Morrow, Lebanon, Mason, or Cincinnati, Ohio home, you know how comfortable they can make your indoor air during the winter months. And while humidifiers are generally reliable, that doesn’t mean they never break down. Fortunately, humidifier repairs are no problem for the expert technicians at Rick’s Heating & Cooling! We can repair any problem you have with your humidifier—simply give us a call and schedule your estimate today! There’s not a lot that can go terribly wrong with your humidifier—as much as they enhance your home’s comfort during the winter, they’re very simple devices. As a result, humidifier repairs are generally extremely simple and are usually caused by dirty or damaged filters or faulty electrical equipment. Occasionally, more complicated things like the humidistat, float controls, or fan can be faulty—but these instances are rare. If your humidifier isn’t properly regulating the humidity level in your home or it isn’t turning on and functioning correctly, contact Rick’s Heating & Cooling! Our professional HVAC experts can help you handle all your humidifier repair needs in Ohio—we can schedule an estimate for your repair. Why Call Rick’s Heating & Cooling for Humidifier Repair? Rick’s Heating & Cooling has been providing HVAC service in the Maineville, Morrow, Lebanon, Mason, and Cincinnati, Ohio area since 1986. Our main goal is to provide dependable, professional service, and treat our customers with a level of respect they won’t find with other companies. We schedule all of our appointments within a two-hour window, and we’ll always call ahead so you won’t be left waiting around all day for a humidifier repair technician. The next time you need a humidifier repair in Ohio, there’s only one name you need to know—Rick’s Heating & Cooling! We have all your humidifier repair services covered. Call us today!